Boys and classes have begun a brilliant project under the guidance of Ms.Majella Killeen to practice and record tracks for a school CD. Copies will be sold as part of fundraising towards ” Help build our wall ” campaign. Launch night to be on Thurs 26th March in Dooleys hotel – Put that date in your planners for what will be a great event ! 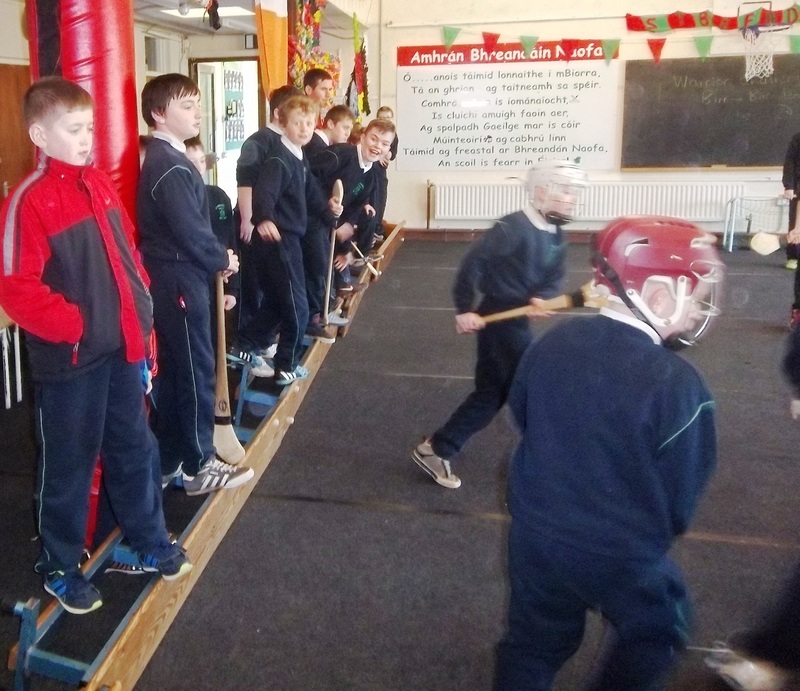 As part of Green schools we are taking part in An Taisce scooter challenge as part of Green school travel initiative. Boys are encouraged to scooter ( safely ) to school and we will have some areas / activities organised during feb during some breaks / lunchtimes. Watch this space ! 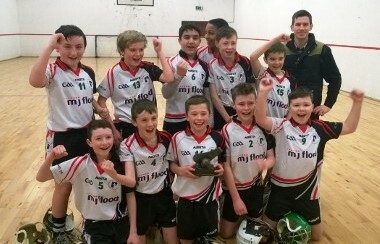 Congratulations to Mr.Kennedy and his hurlers on another triumph at the Offaly Indoor hurling blitz in Shinrone. We entered 3 teams with over 30 boys getting the opportunity to play and it was great to hear of many boys making school debuts in the famous black and white hoops. All 3 teams reached finals with 2 teams winning and one team being defeated by last puck of the ball. All played with great skill , heart and pride. Well done to all and sincere thanks to the parents who helped with transport to Shinrone. 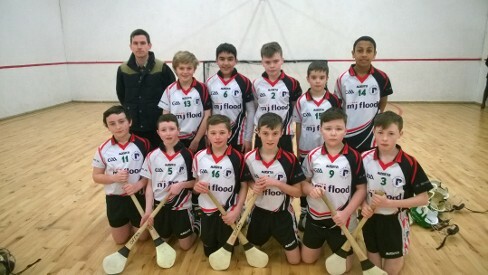 Indoor school senior league was also played with huge numbers of boys taking part this year. Team training continues each Friday at 2pm and school Championship will begin after mid-term. 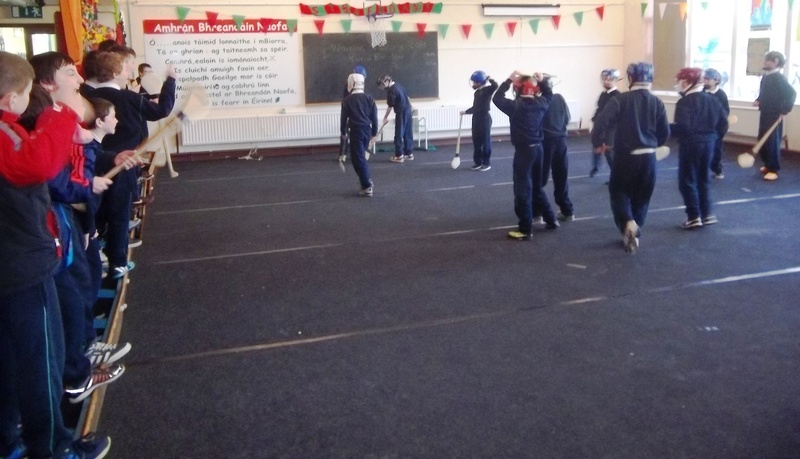 Thanks to Mr. Kennedy for his passion for hurling and to all the staff for helping with class arrangements over past few weeks without which travelling to Blitzes and training would not be possible. 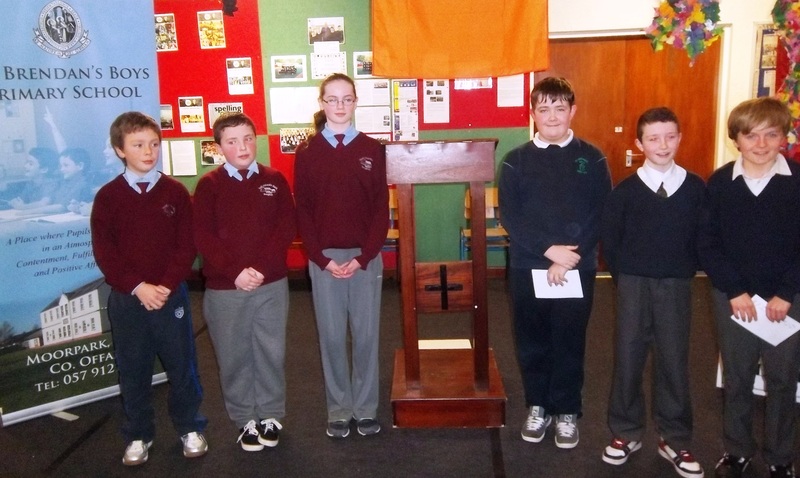 “ All primary school pupils to get their own mobile phones” – Well, that was the argument proposed by the 6th class debating team of St. Brendans PS last week. Needless to say the boys spoke passionately on this subject. 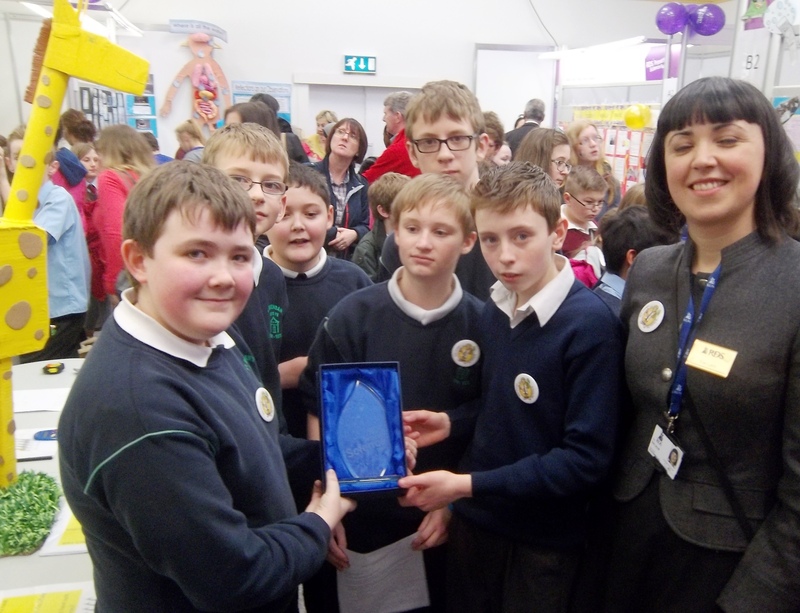 They took part in the Primary school debating competition organised by Laois Education Centre. It was the first time the school had taken part in the competition and they were excellently prepared by class teacher Mr. Damien Cunningham. They had an excellent and enthralling debate with the team of girls and boys from St. Ciarans NS from Broughal who travelled through a snow blizzard to take part. Both teams spoke very well and outlined their arguments and sparks really flew in the crossfire round. It was an impossible decision for the panel of judges to pick a winner and it came down to small margins. 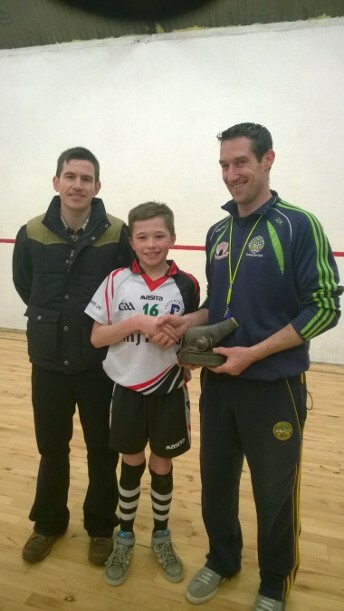 In the end St. Brendans PS team got the victory led by super-captain Darragh Cleary. Team was Darragh Cleary , Nathan Williams , Padraig Kelly, Cain Long, Luke Nolan and Dean Byrne. They look forward to the next round! 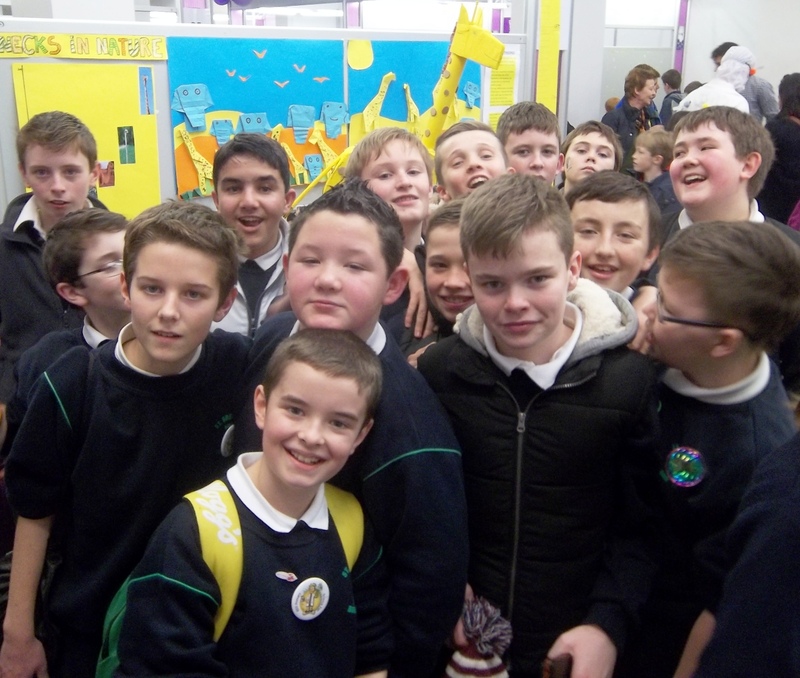 On Thursday 8th of January 2015 my class, Mr. Cunningham, Mr. Carroll, and I went up to the RDS in Dublin to take part in the young scientist’s exhibition. We arrived at school at 7:00 am and we all got on the bus. On the way up I sat beside my best friend Christopher Masterson. 5 minutes of him is bad enough but imagine 2 hours! It was a very long drive. We arrived in Dublin at around 9:30 am. On the way into the RDS we met Ryan Tubridy. We put our badges on and headed down to our stall. We set up our project and then we were split up into our groups for the day. Our project was about “why do giraffes have long necks”? I was in group number 2 so we got to go off for an hour and look at some other science stalls. First we went into a road safety authority van and looked at some really cool driving games and videos. An hour later we headed back to our stall because it was our turn to present the project. We had loads of people coming up to our stall and asking us all kinds of questions about giraffes. A while later a RTE news reporter came up to me and asked me if I would do an interview for the 1 o’clock news. Wanting to be famous I said yes !! After making sure my hair was looking good for the camera, he explained to me how to talk in front of the camera. I answered all of the questions that he asked me and then text my mam to say watch the news. After that a judge came to our stall and asked us loads of questions about our project. We took a model giraffe with us to display on the day which was made with the help of local artist George Dempsey. Then later it was time for us to go off and look at some more stalls. On the way out of the RDS we met the RTE news presenter Sharon Ni Bheolain. Our teachers were very happy to meet her too! We went outside into a tent to eat our lunch. After lunch we went into a really big tent to see a robot show. There were 2 robots that were fighting in a ring. It was really cool. Then we went into a really big hall to see a famous robot called Titon. His show was very cool. After seeing Titon, we went back to our stall for another little while. I met Michael Martin the Fine Fail leader and got a photo with him. I should have taken the photo myself as some old man messed up the photo. After that a woman from the RDS presented us with a trophy. Sadly, it was time to pack up and go home. On the bus on the way home we stopped at junction 14 and got something to eat. We arrived back at school at 6:30pm. We were very tired after a very long and enjoyable day. We would like to thank our teachers Mr. Cunningham and Mr. Carroll for bringing us up to Dublin and for all their hard work. We would also like to thank Mr. Mcardle and George Dempsey for all their help and hard work. It was a great day out and it was much better than sitting in school doing work! Hopefully in the future I will get to have a project in the main event and if not maybe an RTE news presenter.